Georgia Tech’s Marcus Georges-Hunt has turned in back-to-back 20-point games and is 5 points away from 900 for his career. Syracuse’s Rakeem Christmas has scored in double-figures a career-best 11 straight games and leads the ACC in per game scoring improvement (+11.5) from a year ago. Tech’s Charles Mitchell notched his fourth double-double this season with 14 points and 12 rebounds in Saturday’s ACC double-overtime road loss at No. 14 Notre Dame (who’s 3-0 in ACC play). The Yellow Jackets played their first overtime game of the season and its first since last year’s ACC Tournament. On Wednesday, January 7, the Georgia Tech Yellow Jackets hosted the Syracuse Orangemen at McCamish Pavilion. It was a low scoring first half but a very evenly matched game. The Yellow Jackets were expecting a big game out of Marcus Georges-Hunt who scored a paltry 4 points in the 1st Half. Charles Mitchell came up with 9 points in the 1st Half after hard-fought battles in the paint. The points were coming slowly at McCamish Pavilion. That was evidenced by the game being tied at 7 points with 13:00 left in the 1st Half and neither team broke the 20-point mark after 15 minutes of play. Syracuse relied heavily on their star Rakeem Christmas. He totaled 12 points in the 1st Half, shooting 50% from the floor and 100% from the line. There was a lot of great defense being played throughout the game which is why the score was kept so low. Michael Gbinije contributed with 5 rebounds (4 defensive) to help keep the game close. Syracuse took their biggest lead of the game after Rakeem Christmas got the Orange fans off their feet with a monster dunk to give Syracuse their biggest lead of the game, 44-41. Charles Mitchell was fouled with 4:03 left to play and made both his foul shots to bring the game back 43-44. 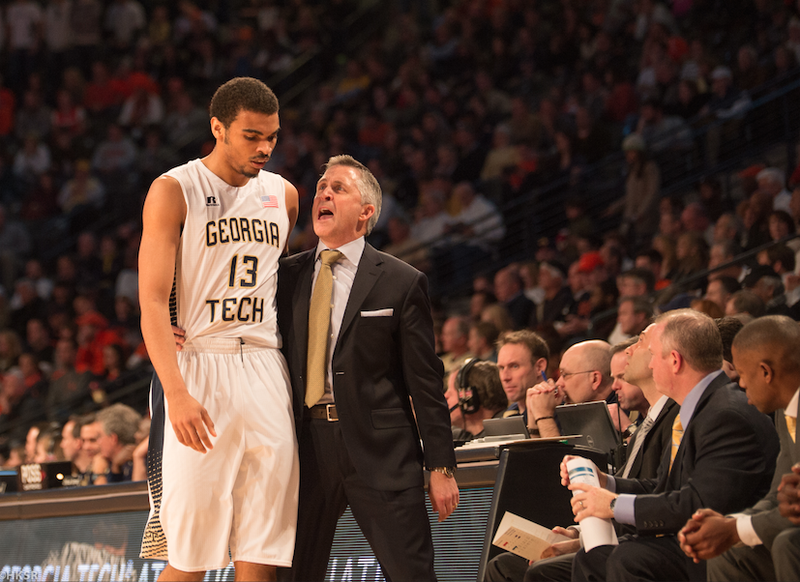 Within a point, the Jackets tightened up their defense and were able to force an errant shot. The crowd went crazy right under 2:00 when Demarco Cox had a wide-open dunk and bricked it hard. The crowd yelled for a foul but none came, but at least they got a fresh shot clock. After a full possession Georges-Hunt was blocked from behind but was fouled in the process. His first shot tied the game and his second took the lead. Syracuse called a timeout with 1:17 left in the game. The entire arena was electrified as both the home fans (in all-white for the “white out” game) and all the away fans in orange knew they were in for a nail-biter. 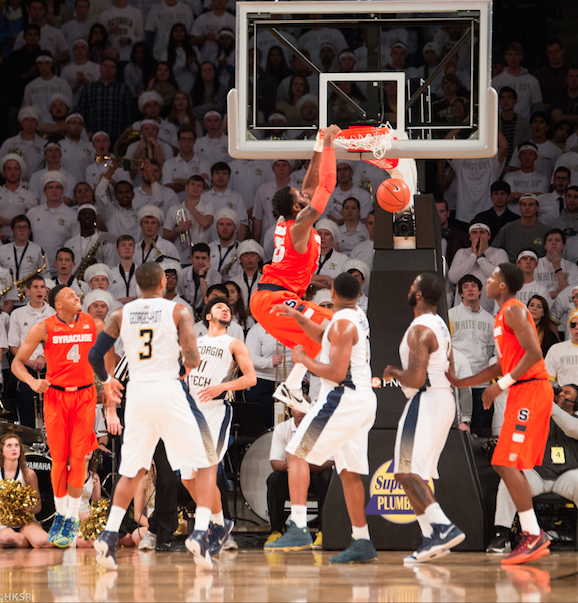 Rakeem Christmas was fouled with 12.4 seconds left. He went to the line to an electric crowd and made his first shot to tie the game and made his second to take the lead. But right after Syracuse took the lead Georges-Hunt was fouled going the other way. Syracuse was leading 46-45 with 6.3 seconds left inside a very loud Mccamish Pavilion. Chris Bolden had an open look with 2 seconds left from 3-pt land but the shot went just wide. So the Orangemen came into Atlanta and stole a nail-biter from the Yellow Jackets 46-43.